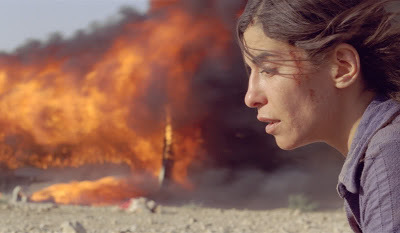 Lubna Azabal in Incendies. Courtesy of eOne Films. The opening sequence in Incendies is a stunning piece of poetic filmmaking: A desert in the Middle East framed in the window of a barracks where a dozen young Muslim conscripts readied for combat are having their heads shaved. Radiohead’s haunting “You and Whose Army?” quietly plays as the camera zooms in on a child soldier who refuses to blink. Quick cut to modern day Montreal. A lawyer is reading the last will and testament of Nawal Marwan (Azabal) to her adult children twins Jeanne and Simon. They learn that their late mother wants them to deliver a letter to their father and their brother. This surprises both since their father has been long dead and they never knew they had another sibling. Nawal also states that she wants to be buried “naked, face down, away from the world.” No name or epitaph on a gravestone because she did not keep her promises in life. However, once the letters are delivered, she can rest in peace in the knowledge of what she was never able to tell her children alive. While this set-up might strike some viewers as shop-worn, it is the stuff that makes Shakespearean drama, grand opera and Greek tragedy lasting forms of storytelling. Incendies (nominated for a best foreign film Oscar last year) tells a tale of lost children, fathers and sons, and mothers who hold those secrets at a great cost. Director Villeneuve renders his film in an almost epic scale. Its mash-up (section titles, pop anthems, and non-chronological structure) echo Olivier Assayas’ Carlos or Abbas Kiarostami’s Certified Copy. Still Villeneuve weaves his riveting tale alternating past with present to a fever pitch. Their quest leads them — Jeanne willingly, Simon reluctantly — to a fictional Middle East country (modeled after Lebanon and their long civil war between Muslims and Christians). The film parallels their search with the mother’s life: as a teen, the Christian-born Nawal has a romance with a young Muslim. Pregnant, she is forced to give up her child as a foundling but not before a midwife tattoos the child’s heel. The child’s mother vows to find him at whatever cost. Nawal (Azabal’s dramatic portrayal is pitch perfect) is a raging life force whose devastating ordeals and star-crossed fate are constantly shifting as she too learns more about herself. As her story unfolds, I dare you to watch without blinking. Incendies retells that age-old song of songs with beauty and grace. This entry was posted in Rag Bloggers and tagged Criticism, Gregg Barrios, Independent Film. Bookmark the permalink. Truly spellbinding film – Loved it!